This truly was to be a Mission Impossible. It was something few had tried, but there was no fear of failure. And we did not fail. We installed a 21st-century dishwasher in an old Grand Banks. There had been a dishwasher-a machine that washes dishes, I mean-on our boats for at least 15 years. It was a portable countertop device, really intended for use in a recreational vehicle (with wheels). It was a Husqvarna, a reliable and effective little machine that was miserly with water. With only two people aboard, we would run it about once a day. Because it ran on 120VAC, we timed dishwashing to coincide with dinner preparation and cleanup, to minimize running time on our generator. There were problems. At least I imagined there were problems. It occupied too much counter space and it required a web of electrical wire and water and drain hoses, one or all of which usually was in the way of whatever anyone was doing in and around the galley sink. It was not particularly attractive, despite a fabric cover Polly, my wife, stitched to hide its unadorned metal sides. The little beast was noisy, too. Its water pump sang a high soprano, and the sprayer inside sounded as if it were firing marbles, not jets of water, against the door and sides. But it worked haard and served us well aboard two boats over many years. No one suffered from dishpan hands on Quadra. I wanted to retire it. Polly said that idea had no merit, but in a gesture of compromise suggested we build in a dishwasher, just like at home. I thought that would require too much ripping, cutting and fabricating, and where would we put our other built-in appliances? So, nothing happened for a long time. The Husqvarna continued to scrub our plates clean, and I continued to fret over the space it required and its appearance. A couple of years ago we went browsing through appliance stores in search of new stuff for our home. One thing that caught our attention was a dishwasher relatively new to the market, one that fits under a counter and slides in and out like a drawer. Two units would fill the space of a standard kitchen dishwasher, but one of the drawer-type dishwashers would work well and fit just right in an apartment or compact kitchen. We had two installed in our kitchen. They are manufactured by Fisher & Paykel in New Zealand. They are whisper quiet. One unit uses less than 3 gallons of water doing a load of dishes. Inspiration struck on a cruise months later. I found a tape measure and checked many dimensions in and around our L-shaped galley. It could be done. Our under-the-counter U-Line refrigerator would be removed from its niche in the galley. A single Fisher & Paykel dishwasher, at 24 inches the same width as the refrigerator, would fit nicely in the upper half of that space. We would build a large storage drawer beneath. Now, what to do with the refrigerator? Just aft of the helm door on our Europa model Grand Banks was a bar cabinet that was about 18 inches deep and 36 inches wide. The top lifted to reveal the bar; there were three drawers below it on one side, and a niche for an icemaker was on the other side. The tape measure revealed that by increasing the depth about 7 inches and the length 11 inches, we would have space for the refrigerator, the icemaker, two drawers and a small, more appropriately sized place to stash booze. The aisle between the face of the new cabinet and the end of the galley counter would shrink to 31 inches, but that is more than adequate. A rarely used engine room hatch is in that aisle, but the wider cabinet does not affect its use. Some friends thought this was nonsense, that we truly had gone overboard. People make good dishwashers, they said. But we persisted. We found support for our notion at the boat show in Annapolis. One of the yachts we boarded, a Jefferson, had precisely the installation we had envisioned/a Fisher & Paykel on top and a storage drawer below. Later, at the Boats Afloat Show on Seattle&apos;s Lake Union, I went aboard a 1960s-vintage 47-foot Willard simply to admire its wonderful styling and was stunned to see one of the drawer dishwashers in its galley. Grand Banks just now has begun installing dishwashers on new boats, but mostly on larger models. So, old or new, it can be done. David Bass signed on as our project manager. He describes himself as a carpenter, but really he&apos;s an artisan. "Hmm, a winter project," Bass said on his first visit to Quadra on an October afternoon. A oneman business, Bass explained he had some other projects on line, including more work aboard Radiant Star. At your convenience, we said, while imposing only one condition: The finished project must look as if it were built by Grand Banks in Singapore, where our boat was launched in late 1978. But the big yacht from Scotland was undergoing engine repair and was not ready for Bass. One day he called and suggested we start emptying drawers. I went to the boat the following day to discover he had done that and that the old bar cabinet was resting in the cockpit. In another couple of days framing for the new cabinet was in place. Some of the cabinetry was fabricated on the boat, while pieces such as drawers and cabinet doors took shape at his home shop out near Similk Bay on the west shore of Fidalgo Island. Bass was on a roll and had time to spare, so we also designated him as dishwasher installer, plumber and electrician. We also asked him to put down new countertops (known as p-lam in the trade), to replace one of the trademark GB sink covers that had disappeared and to install a new sink faucet. This effort and expense was, in part, to satisfy our need to have some of the comforts of home aboard our GB. There was something else going on, however, and that was an equally important effort to update a yacht nearly a quarter-century old without jeopardizing the style and quality inherent in a Grand Banks. We wanted to keep it a safe, dependable and attractive boat. I knew that should we ever want or need to sell the boat, it would go quickly only if it could compete favorably with newer boats in appearance, equipment and performance. In the past few years we have updated its electronics package, adding new radar, GPS and VHF radios (including one with digital selective calling capability). We removed a cute but useless wood-burning stove installed by the first owner, replaced the saloon headliner because of damage from the stove and renewed the electrical wiring and antenna cables that run hidden above the headliner fabric. In another step toward conformity (plus a number of valuable benefits) we added a VacuFlush marine toilet. All of the galley appliances, except for the electric stove, have been replaced with 120VAC householdstyle equipment. With an inverter and a bank of L-16 six-volt batteries we can operate them all for several days without starting the generator (except for meal preparation). The new dishwasher will run through the inverter, but it&apos;s a hefty load so we switch it on at mealtime when the generator is in service. Our boat has increased in value by about 40 percent over 13 years of ownership, and this continuing project, along with other work yet to come, will protect our investment and keep the GB&apos;s value rising. What we have done, many others also have done/except for the dishwasher, of course. 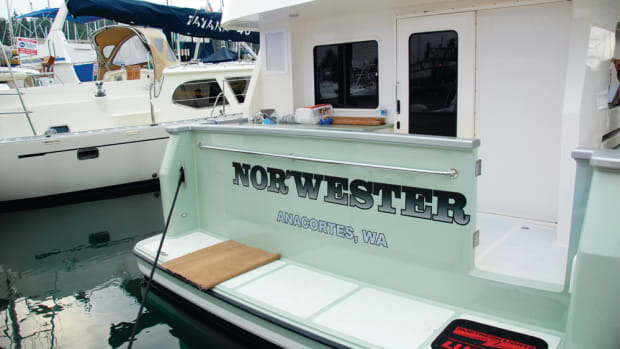 At the recent rendezvous of the Puget Sound Grand Banks Association there was an impressive number of older (1970s and 1980s) yachts that looked as good as the new boats brought by the GB broker, Grand Yachts Northwest. Going aboard, they were warmly and comfortably furnished, often with new fabrics, fresh finishes and equipment not envisioned when the boats were built. Electronics systems were contemporary, and the engines, while original, had been maintained and upgraded. It&apos;s obviously no secret that TLC makes sense. While Bass was finishing up our work in his shop, I installed new windshield wiper motors (two speed, self-parking) and moved the switches from their inconvenient hideaway in the DC circuit breaker panel to the top of the helm station. Pantographstyle wiper arms had been installed in an earlier frenzy of updating. The first owner of our Europa had laid carpeting over all the teak parquet, using nailing strips and staples. We removed the carpet when it became worn and enjoyed the scarred, punctured teak for several years. While our boat, with its pair of Ford Lehman diesel engines, is quieter under way than some new boats, I thought there should be even less thunder in the saloon. The plan is to replace the carpeting, laying the new fabric over half-inch foam-and-vinyl sound-deadening padding to achieve a more pleasant cruising environment. That work was put on hold when it became clear that several engine room projects had priority. 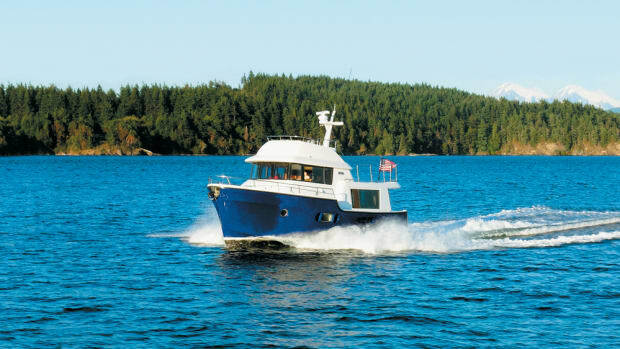 There was no sense endangering new carpet (the only ER access on the boat is through hatches in the galley) while hauling out the Borg Warner transmissions for overhaul, flushing cooling systems and installing external reservoirs and extended-life coolant. The mechanics spilled not a drop of anything, anywhere. The splotch of transmission fluid on the teak in the cockpit was my doing. By the time engine work was finished, the cruising season was upon us. So the carpet project was delayed to early winter, when rain blows through our marina, and David Bass will be ready for another days-of-gloom project. Dishes and glasses had gotten dusty during weeks of sawing and sanding, so we had an obvious need for a trial run of the new dishwasher. Running off shorepower at our moorage, the Fisher & Paykel sluiced the mud away. Busy with other jobs on the boat, we were aware that it was running only because the domestic water pump in the engine room switched on occasionally. The pump we heard clearly; I had to press my ear against the teak front on the dishwasher to confirm it was running. Bass earned four stars by matching GB styling closely and its quality perfectly. He did a couple of things differently, but I doubt anyone will notice. We asked for fiddles on the new refrigerator cabinet, to match those installed by GB. I came aboard one day to find Bass somewhat frustrated. None of the GB-crafted fiddles on Quadra were of the same size or shape. What did we want to do? One close call occurred when the old bar cabinet was removed to reveal ductwork for engine room ventilators against the wall. Careful measurement proved the refrigerator would fit without adding additional inches to the cabinet depth. The icemaker is shallow, and there was empty space behind it. Bass cut a long, narrow door in the after end of the cabinet and put in shelving for general storage and a rack for beverage bottles. He built teak doors to cover what had been an open glassware cabinet on the end of the galley counter. He cut teak panels to cover the white faces of the refrigerator, icemaker and freezer. Bass finished the new teak with multiple coats of rubbed-effect urethane varnish, duplicating the tone of the original woodwork. Proving himself innovative and his body flexible, Bass got head and shoulders beneath the galley sink to connect dishwasher drain and water lines and to provide electrical circuits for the dishwasher. Before Bass had appeared, our galley was basically a one-person place. Two could work, but not comfortably. If something was needed from the refrigerator, cooks and helpers had to evacuate the space while the door swung open. Now there&apos;s room for two. The dishwasher is large, but there&apos;s enough space for galley hands to stand in front of it and unload and stow dishware in nearby storage spaces. The drawer beneath the dishwasher creates the first convenient space in the galley for large pots and pans and even a grill. Moving the refrigerator makes the galley work better. An example: Silverware for the saloon table for years was kept in a drawer beneath the sink. It was sometimes awkward for the table setter to reach around the cook to find the knives and forks. Now, silverware is in a drawer in the new refrigerator cabinet-well away from the center of activity. This obviously may not be possible on every 42 GB, or similar trawler-type yachts, but with imagination and skill it should work on many. Our 1979 model did not have a helm seat fitted to the bar cabinet, which made replacement easier. Another factor in our favor was that the original owner had installed a 24-inch-wide Norcold refrigerator, rather than the traditional GB unit with its huge meat-locker door and envelope of heavy insulation. When we replaced the Norcold we selected the U-Line partly because it would fit in the same space/and that space is just the amount needed for a dishwasher. This would be more complicated on boats with the GB-styled refrigerators because they cannot simply be pulled out of the counter and shoved into a nearby hole in a new cabinet, as can Norcolds, U-Lines and similar units. Holding-plate refrigeration would make it more difficult, too-but not impossible. Although GB hasn&apos;t installed dishwashers in a new 42/so far as I know/it should be simple to do when a boat is under construction. So think about that if you&apos;re shopping for a new one. The possibilities are intriguing on the 36GB. Polly had bought the Husqvarna at a boat show when we owned a wood 36 and asked me to make it work. Turns out it fit beautifully in the space beneath the sink. I removed the sink cabinet&apos;s two doors and put them in storage, built a small plywood platform and slid the dishwasher into place. It almost looked built-in. When we offered the 36 for sale it was easy to remove the dishwasher and replace the doors. Clean and simple/and cheap. 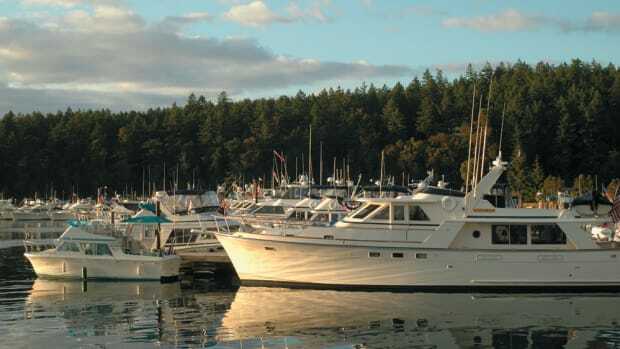 Our remodeled galley was exposed to the public at a yacht club gathering early in the spring and at the GB rendezvous. There was general appreciation for the changes, with women being most impressed. One male friend, speaking for his peers, forced a smile and complained: "You&apos;ve raised the bar a long way."